Want to learn multiple languages at once. This tutorial will show you, how you can easily learn multiple languages French, English, Spanish, Russian, Arabic, Hebrew and much more at the same time !! Many people say learning a new language or learning multiple languages is nothing but a lifestyle choice. Somehow i agree with them, but not completely because sometimes we don’t wish to learn multiple languages but we have to learn according to the need of the situation. For example: knowing several languages is the first priority for all those people who work in foreign countries or for all the people who work for the foreign countries. The Internet will play a vital role if you are willing to learn a new language online. Learning a new language online isn’t a very new thing but yes…..the selection of right online tool or website is very important to online language learning. There are lots of techniques, browser extensions, web apps and websites are available on the web but it’s very hard to select a best one. So, in this article i am going to explain about a very useful and amazing tool which will impress you just in first sight called “Lingua.ly”. Let’s know in details – what’s Lingua.ly and how it works? Lingua.ly is an educational technology startup that takes a digital language immersion perspective to teaching multiple languages such as French, English, Spanish, Russian, Arabic, Hebrew and many other languages too. It allows you to know how nicely you know any particular language and then recommends different words, text to read and improve your communication skills. Even, the option of Quizzes is also available which you can use from time to time to check the outcome of your efforts. Check out the introductory video of Lingua.ly from here. To get started with it, at first sign up for a Lingua.ly account using your Google account or Facebook account. After that choose the language that you wish to learn and then select the word collection option (Either Double click or Alt + double click) to continue. 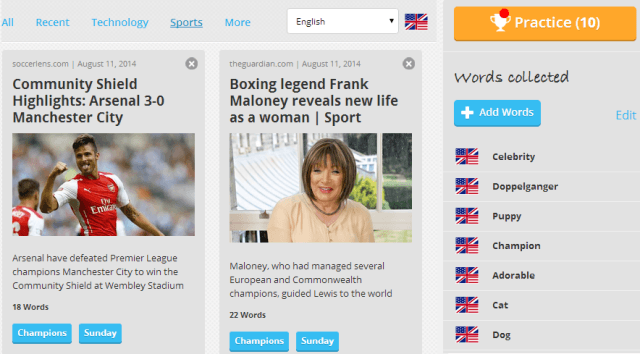 On the dashboard of Lingua.ly, you can navigate to its varied features. Automatically, the app shows you a curated list of recommended material for the language you selected. For the example: If you are a sports person and want to read something related to sports, you can read numerous articles in English, French, Spanish, Arabic or the language you wish to learn. The second way of learning a new language is by opting for a wordpack to expand your vocabulary or by adding your own words. One of the best features of Lingua.ly is, it makes clear to understand by audio pronunciations of the words and with the visual images it makes simpler to learn a language. It wouldn’t be wrong, if we say that – you can learn multiple languages at once with Lingua.ly by writing, reading and listening. While using Lingua.ly, i felt impressed with the amazing way to learn languages by manually adding the appropriate words from websites or webpages we visit. On the webpage, when you double-click on any word then Lingua.ly will automatically pick it up and will display its exact translation as well as its audio pronunciation, complete definition and synonyms etc. 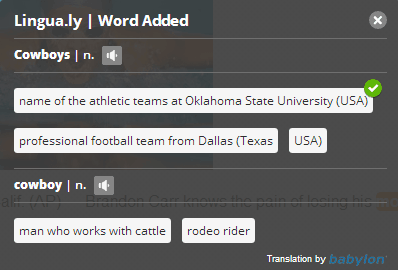 For example: when i double-clicked on the word “Cowboys” then it display the result along with the audio pronunciation as shown below. Overall it can be said that Lingua.ly offers a new and great way to learn multiple languages without spending lots of time. With this app you haven’t to do any extra to learn, just browse the web and learn new languages. Isn’t an interesting way? Feel free to share your view with via comments – what do you think? Lingua.ly is the best way to learn multiple languages at once or not. We are waiting for your valuable comments. Hurry up!!! Thank you so much Kenny for sharing your valuable comments with us. I happy to know that you liked this tutorial. Keep coming !! Hallo there Kumar, I agree with you that learning a new language isn’t just about the fun of it, but sometimes, you could find yourself cornered in a situation where you are expected to speak it. I have used Lingualy before and I really like it. I have also recommended to some friends before and they love it. The thing is, it helps one to make the sentences flow easily. Thanks for the share and keep up the good work.